I know some of you are wondering when this is ever going to end! I know I am. I’m now down to the nitty gritty. Obviously if you make 40+ quilts, you are going to have small pieces leftover. I’ve been collecting them. I’ve been trying to use them, but at this point in the process, I’ve been “seriously” trying to use them UP. Here’s my predicament. This is what I have left. If you remember, I wanted to get my blues pieces down to only two of those boxes - the plastic boxes you see on the right of the table. Yeah! These are the two boxes I wanted to have left! Well, I’ve gotten that part down - even though I found a few more shirts while putting my son and his wife’s things under the eaves of the house. I have since taken them apart, however, and they all fit nicely in the two boxes. In fact, they mostly all fit into one box. In the second box are pockets that I hope to use a lot up as I work on yet another blues pockets quilt top. I did put the Hawaiian shirt scraps back on the shelves with my FL fabrics and other Hawaiian fabrics in my ‘new fabrics’ room even though they aren’t new. 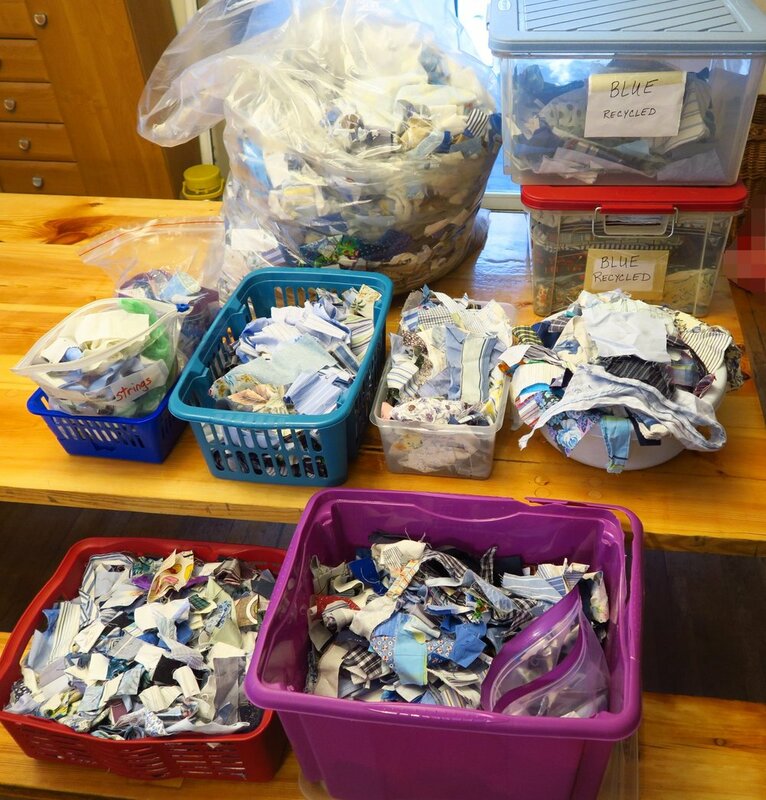 I have already sorted one of these bags already and put some in kindling, some in boxes that are for 2” wide strips and pieces an some that are 2.5” strips and squares. And here are two more plastic boxes with small pieces in them. Sigh. In the end I will probably just put my 1.5” pieces and my other pieces in with other pieces that size - not necessarily “upcycleds”. it’s the big purple container I’m considering how to use up. So…I am down to leftovers now - so I’ll keep going. I’m getting ready to make up some backings, though for those 5 finished tops that aren’t quilted yet. It actually feels like big progress in having compiled it to this much (or little, depending on your point of view). And now you know! Have a great day! This is what’s been going on in my world!